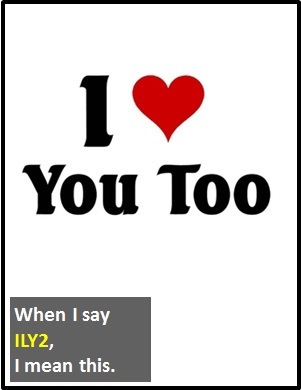 ILY2 | What Does ILY2 Mean? ILY2 means "I Love You Too". ILY2 normally appears at the very end of a conversation between partners or family members. It is typically used as a sign-off (much like CYL (see you later) is used between friends or colleagues). ILY2 is also commonly written as ILU2 or LU2. Person A: I'll see you next week. ILU. Person A: I<3U more each day. ILY2 is used as a standalone declarative sentence (i.e., a statement). Of interest, ILY2 is classified as a cyber term as opposed to an initialism abbreviation or an acronym. Initially, cyber term terms were introduced for brevity, but, particularly with the advent of predictive texting and on-screen keyboards, they are now mostly employed for fun. Cyber terms differ from icons because they are not pictorial representations. Before the digital era, we would have just said "I love you too" or DITTO instead of ILY2.